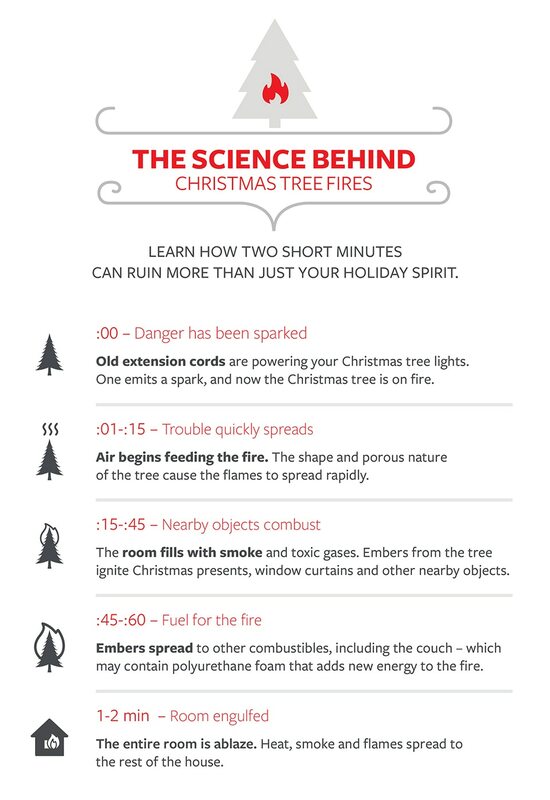 From the moment a spark ignites a Christmas tree, it can take only a matter of minutes before noxious smoke and scorching heat fill the entire room, igniting everything within it. Seconds later, the fire can travel up a staircase and perhaps make escape virtually impossible for anyone on the second floor of your home. There’s a scientific explanation for why these types of fires can be so dangerous, explains John Machnicki, a Travelers Risk Control fire safety professional. It has to do with how much heat energy a tree can emit and the conditions that allow the temperature within the room to rise so quickly. “Christmas trees are powerful fuel sources, especially when dry,” Machnicki said. “The tree becomes a fuel that burns very rapidly and gives off a lot of heat energy.” A blazing tree can give off as much heat as forty thousand 100-watt light bulbs, enough to create flashover within a room, where all objects begin burning at the same time. That heat gets trapped at the ceiling, then banks down, forming a hot gas layer full of smoke. This combination of heat and smoke makes it impossible for anyone in the room to survive and could make it difficult for those in other parts of the house to escape. Here’s a look at the science of how quickly a Christmas fire can turn deadly. For that reason, taking precautions when choosing and decorating a tree becomes extremely important. Give live Christmas trees a fresh cut. Machnicki always chooses a freshly cut Christmas tree so it will absorb water and stay fresher longer. “Sap flows out of trees, so without a fresh cut at the bottom, water up-take might not be as good,” Machnicki explains. Water your tree daily. In Machnicki’s household, a dry tree is immediately shown the door. Constant watering keeps trees fresher longer, but the moment the tree appears to drop its needles, it’s a sign that it is drying out. Use approved lights and connect them properly. Choose lights tested by a nationally recognized testing laboratory, such as Underwriters Laboratories (UL). Avoid connecting multiple extension cords and more than three strands of lights. Inspect lights and decorations. Before decorating your tree, lay out strings of lights and look for any broken or missing lights. Needles can get stuck in empty light sockets, creating a potential fire hazard, Machnicki says. Electric energy passes through the bulb sockets and can cause needles to ignite. Toss damaged lights and decorations. Don’t attempt to repair light strings if they are worn, frayed or show other problems. Throw them away and buy a new set of lights. Choose your tree’s location carefully. Place the tree away from stairs, where fire can quickly travel to bedrooms. Avoid placing it near heat sources, such as a wood stove or fireplace. Being close to radiators and heat vents can more quickly dry out a tree. Avoid combustible ornaments. Pinecones and other ornaments can add fuel to a Christmas tree fire and should be avoided. Keep pets safe. Pets can chew, paw and otherwise damage lights and potentially knock over the tree. Unplug at night. Never leave the tree plugged in when you are away from home or asleep. Close bedrooms doors. Closing your bedroom doors at night can keep out harmful smoke and flames in the event of a Christmas tree fire, giving you more time to escape. Test smoke alarms. Make sure smoke alarms are properly located and in working order. Taking these precautions to help make your home safer over the holidays can help you enjoy your Christmas tree and help keep your family safe.